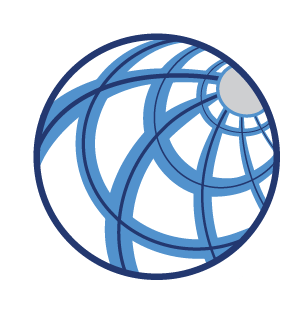 IIR's global industrial outlook provides easily navigated spending projections for 12 industrial market sectors. The newly released North American Power Industry Outlook provides an in-depth analysis of the market trends and statistics driving major project spending opportunities in the power market. Authored by Industrial Info's industry experts, this comprehensive online tool gives you valuable insight into 2019 and beyond. Get detailed spending analysis by market region, fuel type and project type that are derived from actual projects reported by our research professionals. Quarterly updates keep you informed throughout the year on actual performance versus forecasted activity. If your target market is the Pharmaceutical-Biotech Industry, get clear direction with our 2019 North American Pharmaceutical & Biotech Industry Outlook. Industrial Info has developed a comprehensive and intelligent product that provides a forward-looking capital and maintenance spending forecast, as well as detailed information about business, corporate, plant and project trends taking place in this rapidly expanding industry. With our online solution, we provide quarterly updates on key plant and project statistics that keep you up to date with industry progress. If your target market is the Mining Industry, get clear direction with our 2019 Global Mining Outlook. Industrial Info has developed a comprehensive and intelligent product that provides a forward-looking capital and maintenance spending forecast, as well as detailed information about business, corporate, plant and project trends taking place in this explosive industry. With our online solution, we provide quarterly updates on key plant and project statistics that keep you up to date with industry progress. Industrial Info is tracking more than 2,500 Mining Industry projects valued at almost $500 billion that are planned to kick off across the world in 2018. 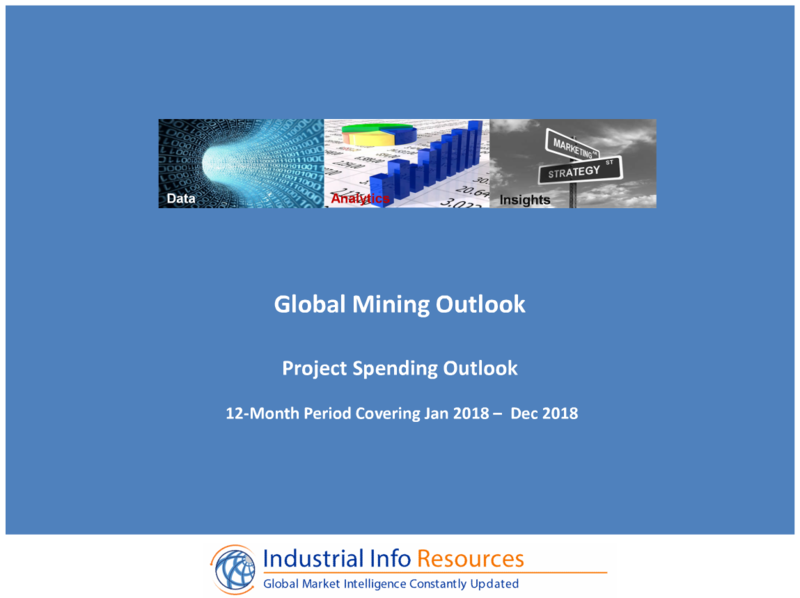 The 2018 Global Mining Industry Outlook provides an in-depth analysis of mining project activity that includes major project spending statistics by mined product and country. Spending statistics are derived from actual projects reported by Industrial Info. 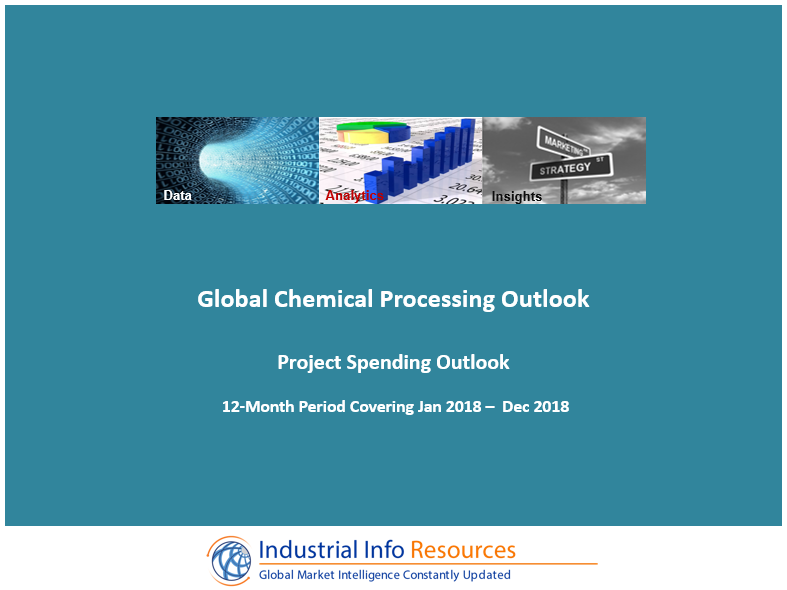 The Chemical Processing Outlook allows subscribers to access a quarterly updated report on project and spending data in the global market. The report has a number of different views such as Geography, SIC Grouping (i.e., Petrochemicals, Agricultural Chemicals, Surfactants, etc. ), Spending Type (Capital vs. Maintenance) and Project Type (New Build, Upgrades, Expansions, De-Bottlenecks, Maintenance). The 2018 North American Power Industry Outlook provides insightful spending analysis and trends impacting the Power Industry market in 2018. 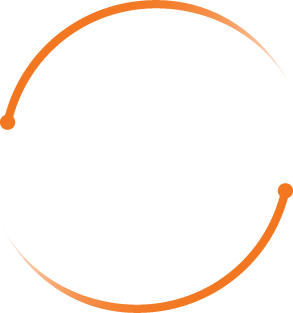 With the Power Outlook, you will obtain a highly informed perspective of the market from our industry experts. The spending forecast is based on actual projects, with quarterly updates reflecting changes in the industry. If your target market is the Pharmaceutical-Biotech Industry, get clear direction with our 2018 North America Pharmaceutical & Biotech Industry Outlook. Industrial Info has developed a comprehensive and intelligent product that provides a forward-looking capital and maintenance spending forecast, as well as detailed information about business, corporate, plant and project trends taking place in this explosive industry. With our online solution, we provide quarterly updates on key plant and project statistics that keep you up to date with industry progress. Industrial Info is tracking more than 730 Pharmaceutical & Biotech projects valued at over $20 billion that are planned to kick off in North America in 2018. Our 2017 Pharmaceutical-Biotech Industry Outlook provides an in-depth analysis of the industry, including major project spending statistics by company and market region, as well as historical plant trends. Spending statistics are derived from actual projects reported by Industrial Info. If your target market is the Mining Industry, get clear direction with our 2018 Global Mining Outlook. Industrial Info has developed a comprehensive and intelligent product that provides a forward-looking capital and maintenance spending forecast, as well as detailed information about business, corporate, plant and project trends taking place in this explosive industry. With our online solution, we provide quarterly updates on key plant and project statistics that keep you up to date with industry progress.